My wife pick this up for me for my birthday. So we started a little routine of having the neighbors over in the evening for a beer around the fire. It was so much fun that my wife suggested we plan a casual dinner party. Everyone had so much fun that it is now become a by monthly event! Love it. I have had my fire pit for more than five years now. It has held up to hundreds of fires, camping trips, cook outs and parties alike. It puts out great heat when needed and can support really big fires! Always a conversation piece and I have multiple friends who have also bought an SS fire pit! "We bought our fire pit two years ago and have enjoyed it - five stars! We have seen more expensive fire pits and cheaply made fire pits, but we find S&S to be the best." The 30 Elliptical Decorative Fire Pit is exactly that; our most decorative fire pit. It’s also one of our most popular styles taking it’s influence from the old decorative works produced by blacksmiths in years gone by. The curls and twists give it it’s unique decorative look. The legs are made using re-purposed solid steel handrail terminals and the handles are re-purposed steel decorative pieces that you might find on fences or stairways. We’re always trying to find new ways to re-use or re-purpose things and this fire pit is no exception to that. 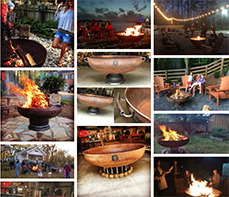 The 30 Elliptical Decorative Fire Pit, like all our fire pits, is handcrafted using high quality American made steel and made in the USA, by our hands. We take extreme care, as with all our products, when making this decorative fire pit to ensure that everything is perspectively correct so that when viewing this fire pit from a distance some might ask if it is a piece of art. This fire pit is all about the design. You might find this 30 Elliptical Decorative Fire Pit might already match up to some of your cool wrought iron furniture you might have out on your patio, or better yet it might just influence you to update or make a design change to your outdoor living space. Being 30″ in diameter and 16″ finished height this 30 Elliptical Decorative Fire Pit will satisfy 2-5 people without feeling crowded. For those that might need to go just a bit bigger then you might consider our 36″ Elliptical Decorative Fire Pit or even better our 42″ Elliptical Decorative Fire Pit will handle the big party when you want it. 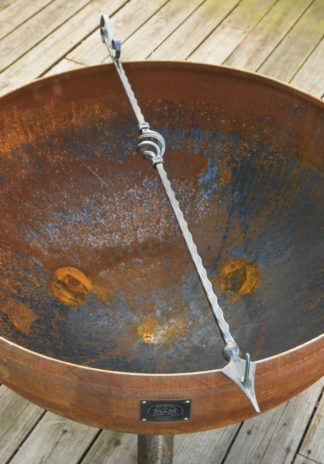 The 30″ Elliptical Decorative Fire Pit has a 1/2″ drain hole and comes with one of our 46″ handcrafted fire pokers too. Don’t forget the 30″ Snuffer and some handcrafted hooks to hang your poker and snuffer lid with.